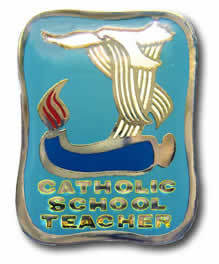 The words "Catholic School Teacher" are placed on a light blue background. A white symbol of the Holy Spirit is outlined in gold with gold rays. The Lamp of Wisdom and Knowledge is dark blue with a red and gold flame.